Valentine's Day murder mystery parties galore! It’s officially Valentine's Day Weekend, and the events reflect that -- Use this compiled list as your guide to planning something fun! Celebrate Black History Month in style. Come and enjoy a fun day of drumming, singing, dancing, lectures, and kids' activities, including free kids face painting! Plus, the first 25 guests will receive a gift. Admission is free. For more information, check out the event here! Come and enjoy a formal charity event that's intended to bring women and men together and get them chatting. Who knows? You might just find the one! Tickets are selling for $15–$25 a person. A portion of the proceeds will go to the Greater Baltimore Chapter of the American Heart Association. For more information, check out the event here! Enjoy a delicious French fare and hot tea for an all-inclusive afternoon -- you'll feel like you're in a small French bistro. Tickets are selling for $42.50 a piece. For more information about the event and the menu, check it out here! Party for the animals, and donate to the Animal Allies Rescue Foundation (AARF). Your all-inclusive ticket includes a free pint, a buffet spread, musical stylings of The Dirty Vacant, and one ticket for a chance to enter to win a fabulous prize! Tickets are reasonably priced at just $20 each. For more information and to get your tickets, check out the event here! 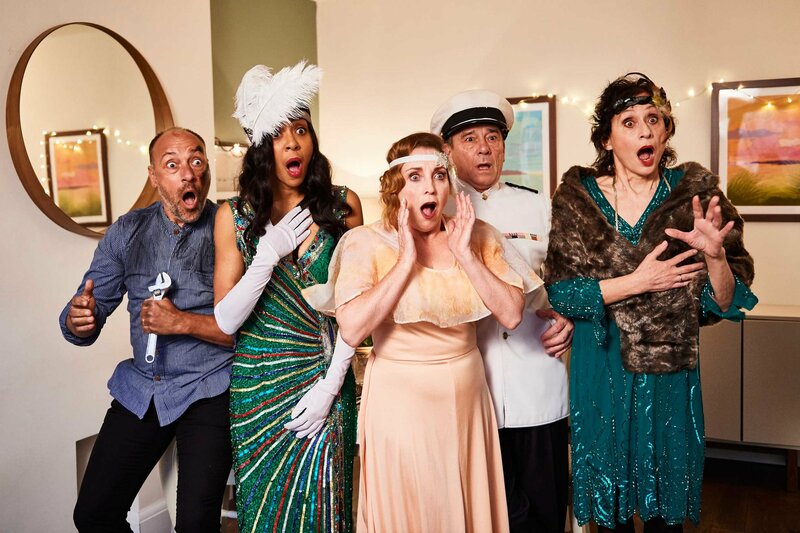 Solve the mystery at this celebrity-themed who done it Murder Mystery Dinner. The theme for the evening? Hollywood pre-awards gala. Dress like your favorite celeb, and work with the other guests to solve the mystery. Tickets are just $75 a person. For more information, check out the event here! A culturally relative Afro-Carribean rave that consists of activities with a tribute to LOVE. Join them for a truly memorable experience and celebrate Black History Month in style. Tickets are selling for just $10-$15 a piece. For more information, check out the event here! Join them every Friday and Saturday for a party with food, diverse sounds, and cultures! The music will be provided by DJ Aakil, TayoTheDJ, & DJ MULUKUKU. Admission is free! For more information, check out the event here! Head on down for the not-so-typical Hamilton special sing-a-long version of the famous play. Get up on stage and sing and rap to the greatest soundtrack of all time. The best part is that a portion of the proceeds goes to the Gilder Lehrman Institute of American History. Tickets are very affordable at only $17.76 a person. For more information, check out the event here! This is the perfect event for the beer enthusiast. The event will feature exclusive beer releases you won't find at your local craft beer store so head on down to try some great beer. Tickets for the event are selling for only$55-$75 a piece. For more information, check out the event here! Battle it out for which decade comes out on top. The '80s were marked by bright colors, questionable clothing choices, and big hair, while the '90s were known for low-rise jeans, grunge wear, and great cartoons. Head on down to the BARCODE for some fun music and delicious food. For more information, check out the event here! Go to Italy without getting on a plane! They're bringing the culture and romance of Italy right to you. The evening will include ballroom dancing, a “Roméo et Juliette” opera presentation,late-night DJ and dancing, and delicious food.You get a lot of bang for your buck with the tickets priced at $125-160. For more information, check out the event here! Have your detective dreams come true for a fun Valentine night Murder Mystery Party. Who did it? It's up to you to find out, so put your skills to the test and solve the mystery. Anyone can become a leading suspect. Tickets are selling for $60 (guests under 21) and $75 (guests over 21). For more information, check out the event here! From the costumes and set to the work of the talented actors on stage, TAP’s production of Arsenic & Old Lace will surely keep you laughing! For tickets, purchase online. Comedian Myq Kaplan was a 2010 Last Comic Standing finalist and has appeared on the Tonight Show with Conan O’Brien, the Late Show with David Letterman, and Comedy Central Presents. If you want to check him out before going to see his show, check out his podcast, Hang Out With Me. For more information, check out the event here! Bring your significant other for a delicious dinner catered by Cora's Custom Creations, and paint a one-of-a-kind work of art with D.Duck Art. There will be music, food, art, drinks, door prizes, fun, and most of all LOVE! Tickets are selling for $45 (single ticket) and $80 (couples tickets). For more information, check out the event here! Head on down to The Well Art Gallery for a pop-up Valentine's Day event. Bring your boo, yourself, and your friends for a chance to take some fun photos. Tickets are selling for just $20 a pop. For more information, check out the event here! Head on down to Norfolk for the Norfolk Theatre Festival. There will be a variety of plays including The Wizard of Oz, A Comedy of Errors, Choir Boy, and many more. Ticket prices range depending on location and the play. For more information, check out the event here! Come and join fellow poetry fans as you enjoy some original content. Support your fellow writers for an evening of fun. Admission is free, and the event will be from 3:30-4:30 p.m. Find out more here. Join the River City Spirits Festival for 20+ Virginia craft spirits, local breweries and cideries, live music, great food, and more! Head on out for a full day of fun! Tickets are selling for $30-$40. For more information, check out the event here! Come and enjoy a night of mystery, intrigue, and murder. Enjoy a fun evening of a guessing game and multiple murders. Guess who the next victim will be -- just be careful because you could be next. Tickets are selling for $91.72 a piece. For more information, check out the event here! The theme of the Masquerade ball will be “Education: An Investment of a Lifetime.” All proceeds from this event will support The Beta Gamma Lambda Education Foundation and the chapter's community outreach programs. Tickets are selling for $85 in advance and $95 at the door. For more information, check out the event here!